Switch off the engine, ignition, mobile telephone and auxiliary heater before refuelling and leave them switched off during refilling. Pull the release button up . 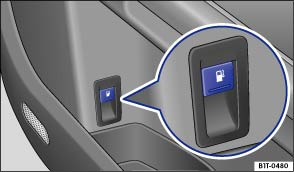 Open the tank flap at the rear right of the vehicle. Turn the tank cap anti-clockwise to remove it and place it in the holder in the tank flap hinge . The fuel tank is full, when the properly operated automatic filler nozzle clicks off for the first time . Do not continue filling up after it switches off! The expansion space in the fuel tank will otherwise fill up and the fuel could spill out. This could also happen when the fuel warms up and expands. Turn the tank cap clockwise into the fuel filler neck until you can hear it engage. 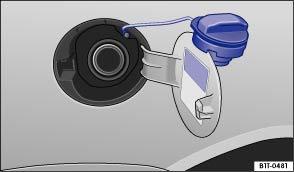 Do not continue refuelling once the filling nozzle automatically stops. The fuel tank could be overfilled. This could cause fuel to splash out and overflow. This could cause fire, explosions and serious injuries. Split fuel can pollute the environment.